It’s no secret that crime rates in Baltimore are at all-time highs. With more that 320 murders this year and luckless tourists being beaten in the streets, the illusion of safety conjured with the whimsical moniker “Charm City” has given way to “Murdermore.” City residents are mortified as they consider the almost nightly bloodbath, and a beleaguered police department is in no position to assuage their fears. The streets – and in many cases even the family homes – are simply not safe. But try to obtain a permit to carry a concealed weapon for personal protection in Baltimore and you’ll wonder whose side Maryland lawmakers are on. Few subjects in America are as polarizing as the issues surrounding the right to bear arms. 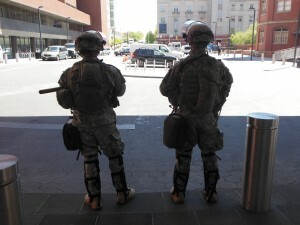 Yet when it comes to the area of self-defense, people from both sides of the debate are starting to find common cause. 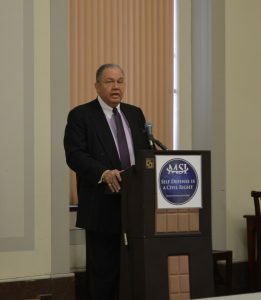 That was evident on Saturday, when Baltimore attorney and veteran civil rights activist, A. Dwight Pettit, addressed the quarterly meeting of the group, Maryland Shall Issue. The meeting took place in the assembly hall of Baltimore’s War Memorial Building. Maryland Shall Issue (MSI) is an all volunteer, non-partisan organization dedicated to the preservation and advancement of gun owners’ rights in Maryland. MSI seeks to educate the community about the right of self-protection, the safe handling of firearms, and the responsibility that goes with carrying a firearm in public. Pettit spoke for some thirty minutes about his personal journey in trying to obtain a concealed weapon permit. His story served as backdrop to the difficulty Baltimore City residents face in securing and using a gun for self-defense. “What’s happening with crime in Baltimore City has reached emergency proportions,” said Pettit. “There is a great concern amongst citizens who want to protect themselves, but there seems to be a racial disparity when it comes to obtaining a carry permit. I think this gets into the legal theory of equal protection under the law. Pettit recalled two landmark cases he was involved with in the 70’s, where racial inequities were exposed through the legal system. One dealt with the number of African-Americans admitted to the Maryland State Bar. The other centered on race-based arrests. In both cases, the suits relied heavily on statistical information. “In applying for gun permits today in Maryland, race is something that is requested on the application. If they have those statistics, then they would also have information on people who have been granted or denied a permit. If the litigatory process is moving forward, that would have to be part of the grounds for establishing an equal protection argument. 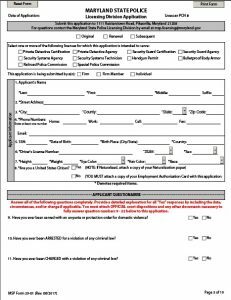 Race is one of the lines an applicant must enter on the Maryland State Police Concealed Weapon Permit application. “I believe the courts have established that, if you can show a statistical imbalance, then you have shown a prima facie case for the other side to come back and refute that evidence – that there is no discrimination. Pettit said his current concealed weapon permit application has been in the works for well over six months. Some of the hurdles he has had to jump have included providing the state with his decades-old military service records in lieu of mandatory firearm training; appearing for an interview to corroborate information he had affirmed on his application; and producing business financial records – including his banking deposit slips. “The officer at the interview also asked about references – even though he said he sees me on television all of the time. As an example of the onerous restrictions law abiding citizens face, Pettit noted he has represented a number of uniformed security officers who were cited for carrying legal service weapons. “These people were going to or leaving work, and the police – in a capricious manner – refused to accept their travel needs and dragged them into criminal court. Pettit cited other examples of problems the current laws present to city residents. These included the need to travel out to Baltimore County for a State Police interview, when most city residents rely on limited public transportation; and a requirement to qualify at a live-fire range, when such facilities don’t exist in Baltimore City. “I believe these restrictions are unconstitutional and are particularly aimed at African-Americans, at the economically disadvantaged, and at people of color. “I speak with people every day, and once they understand the issue – that criminals are always going to get guns and they are not going to go through the legal process to obtain their weapons – then they understand the imperative for protecting their loved ones. The challenge is that Maryland is one of the few states still in the dark ages. Page 5 0f the 10 page Maryland State Police Concealed Carry Permit application. 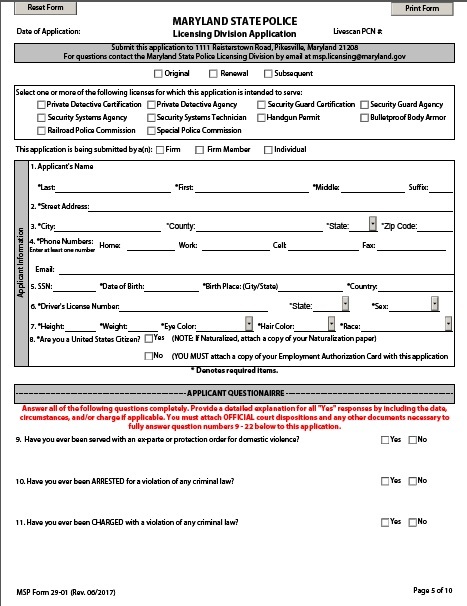 Race is one of the lines an applicant must enter on the application. They only people crying about not being able to get one are the ones prohibited from getting one. The Trump voting Deplorables think wife beating and underage children abusing aren’t really crimes. Rarely anyone who doesn’t meet MSP’s standards bothers to apply. Applications as well are dismissed, and never even part of the statistic when you get the phone call from MSP advising you, “This aint going to fly, you still want to proceed?” Great trick to get that 95% number isn’t it..
Well done. As I sat getting fingerprinted for my handgun qualification license, I couldn’t help but wonder how many drug dealers in Baltimorgue were exchanging crack for guns. Maryland has some of the most restrictive gun laws in America, yet years after Brian Frosh, who, ironically, is constantly protected by armed state troopers, and his democratic allies promised to enhance the safety of Marylanders by passing the Firearms Safety Act of 2013, which was passed in response to the tragedy at Sandy Hook Elementary in Newtown, CT, nearly one person is murdered by someone using a gun in Baltimore every day — a rate that is at an all time high. FSA 2013 did nothing to make Maryland safer from criminals. Chicago, also run by democrats, is nearly equally bad. The problem in Maryland, and Chicago, is that, due to the difficulty of obtaining a concealed carry permit, criminals know that their victims will be unarmed. In Maryland for the most part, only criminals have guns out on the streets. FSA 2013 was passed after some whacko shot his mother while she lay in her bed, who then proceeded to a gun free zone to kill a score of innocent children. Not even complete confiscation of every firearm would prevent such a determined and deranged individual from perpetrating such a horrendous crime, because like illegal yet plentiful drugs like meth and opiods, guns will always be available to those who want them. The solution is to give up the notion that guns are bad, and realize that there is no such thing as a gun-free zone. Instead, we need to realize that the problem is bad people, and relax our dysfunctional state gun laws so that law-abiding citizens are able to defend themselves and others against those intent on doing harm, wherever they may be. I wonder how many of the 13 people shot like fish in a barrel in the bathroom at the Pulse nightclub wish they had been able to shoot back. If just one of them had a gun, things would have turned out far differently. And it wouldnt hurt if our elected officials actually read and understood the Constitution that they swore to uphold, either. I found this article very enlightening. It would seem that a criminal can go to his friend and get a handgun and be on the streets of Baltimore never having to have an HQL or a concealed carry permit. However, those living in the state AND are law abiding citizens have to spend hundreds of dollars and wait 6 months or more to be afforded the ability to own a firearm and carry one to protect themselves. Why are we electing these politicians that feel this is the best course of action? I bet these politicians have their permit to carry or they have armed security like our Attorney General, Frosh. When will we deny the criminal the upper hand. A criminal would have second thoughts if he didn’t know who had a handgun to defend themselves. I would love to be able to defend myself against the criminal, but I can’t afford all of this money only to be denied by the state of Maryland. BTW, self defense is one of the reasons the 2nd Amendment is in the Bill of Rights. Dismayed in our politicians and their practices against the average citizen. Within this country’s nearly 4 million square miles, virtually ALL “gun violence” happens within the less-than-400 square miles represented by the inner cities of only about two dozen of our major cities, and almost all of it is drug-fueled gang violence. Were these enclaves excluded from America’s gun violence statistics, we would rank among the safest places on Earth. Put another way, if you stay out of places like that, then you ARE living in the safest place on Earth. Perhaps not coincidentally, those two-dozen-or-so cities are and have been run by virulently anti-gun Democrat mayors, city councils, and other functionaries. Statistically, it is more dangerous to have a Baltimore address than it is to be a police officer in the United States. At what point do the citizen-voters of Baltimore start thinking that whatever they’re doing is not helping? Just one minor quibble — I think he should take a training course rather dig up his old military service records. The stakes are so high, it’s worth it. Have you taken the training course? I’m betting no, if you think there is any value to it. Give some remarkable statistical differences on carry via states that require no training vs ones that do. The answer is, no difference anywhere. I would have to view the statistics for myself. From experience, I know that many people compile statistics more for their ability to persuade than for the ability to enlighten. I think it’s counter-intuitive to believe that people who have had training in how to draw faster safely and to shoot accurately aren’t able to draw faster more safely and to shoot more accurately than before.